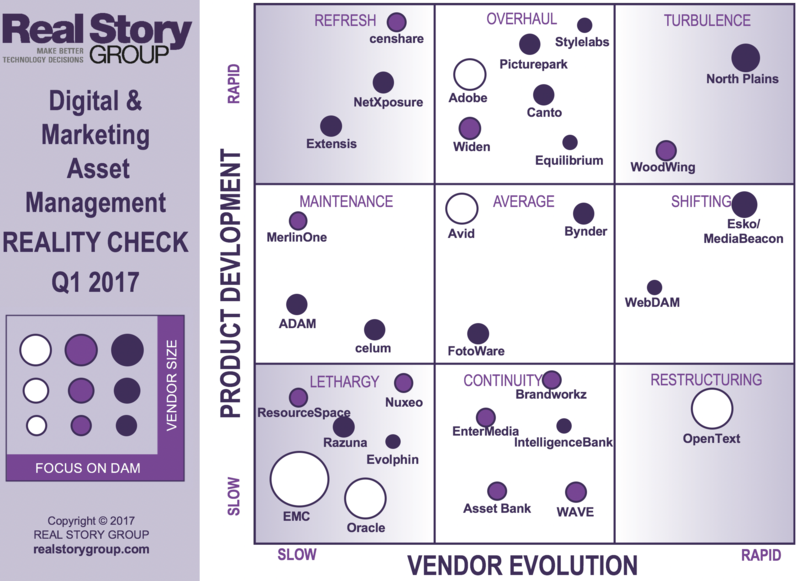 2017 DAM Reality Check: How fast are vendors and tools evolving? When committing to a technology purchase, you are committing to a short-term implementation — and a long-term relationship. Both time-frames hold risks. So each year, Real Story Group measures the pace of change in the marketplaces we cover, both from a vendor and a product perspective, and calculates attendant risk profiles for you the buyer. Focus on DAM – How much of the vendor’s efforts are focused on DAM: a side activity or sole focus? 2017 DAM Marketplace Reality Check. Click to enlarge. The intersection of the vendor evolution and product development dimensions form nine distinct areas that illustrate each vendor’s overall rate of change — and as you can see, DAM vendors are all over the map this year. Each buyer will rate the importance of these dimensions differently, and I encourage you to explore RSG's interactive tools, which contain dozens more data points. If your enterprise is an RSG DAM stream subscriber, just log in to access the complete analysis.